Snacking should be an official sport. Or at least a national pastime in Singapore, a land abundant with tidbits from all over the world. 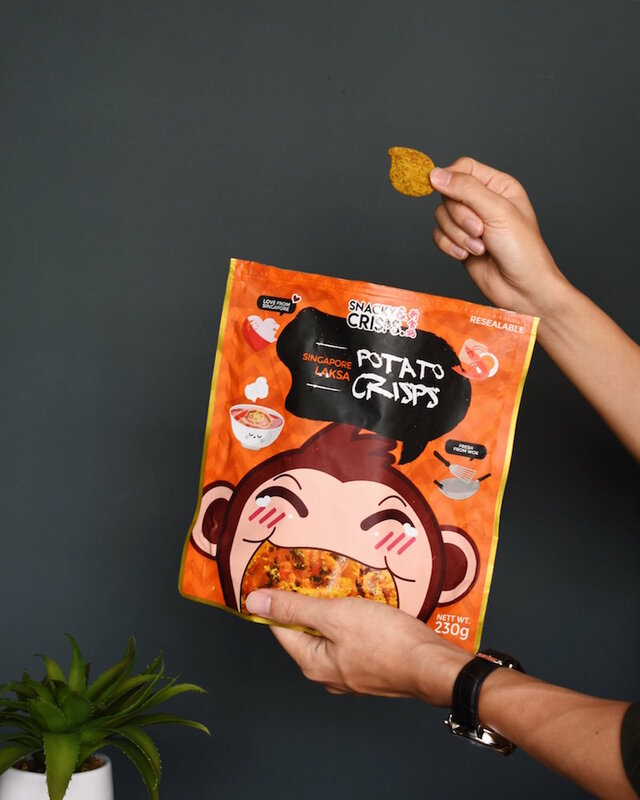 But we're not here to focus on imports - we're here to talk about local (or locally-based) brands and their lovingly-crafted potato crisps of all kinds inspired by familiar flavours like salted egg yolk, chicken rice, and egg prata. There's also mala, which we'll get to later. So the next time you're craving a solid bowl of laksa, you can easily snack on potato chips that taste (almost) the same. Or if you can't stop thinking about chilli crab after lunch, well, get a bag of seaweed tempura crisps. Just sayin'. Behold, our list of snack brands for you to bookmark below. You may remember F.east (Flavours of the East) from its viral fame last year, thanks to its intriguing debut with flavours like Hainanese chicken rice and laksa potato chips. Sure, the former is more of a subtle tribute to its namesake dish, but the latter, well, you can't really go wrong with laksa's classic combination of coconut milk, chillies, shrimp paste, and spices. 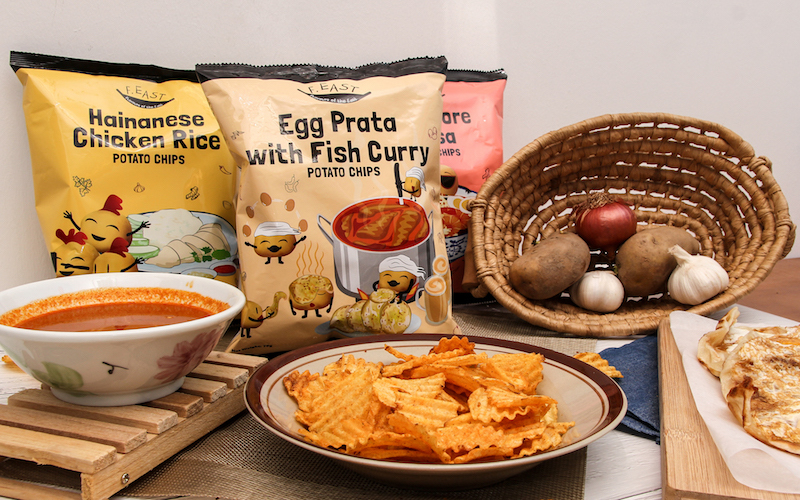 These crinkle-cut chips got so much attention that the company came back barely a year later with a mind-boggling new creation: egg prata with fish curry. How oddly specific. But no matter, it was made to fascinate, which it did with chips that tasted like curry and a subdued aftertaste that was more egg than prata. Still, these exotic morsels beat plain old sour cream and onion or BBQ sauce any day. Available at 7-Eleven stores and selected NTUC Fairprice and Giant supermarkets. S$2.95/packet. 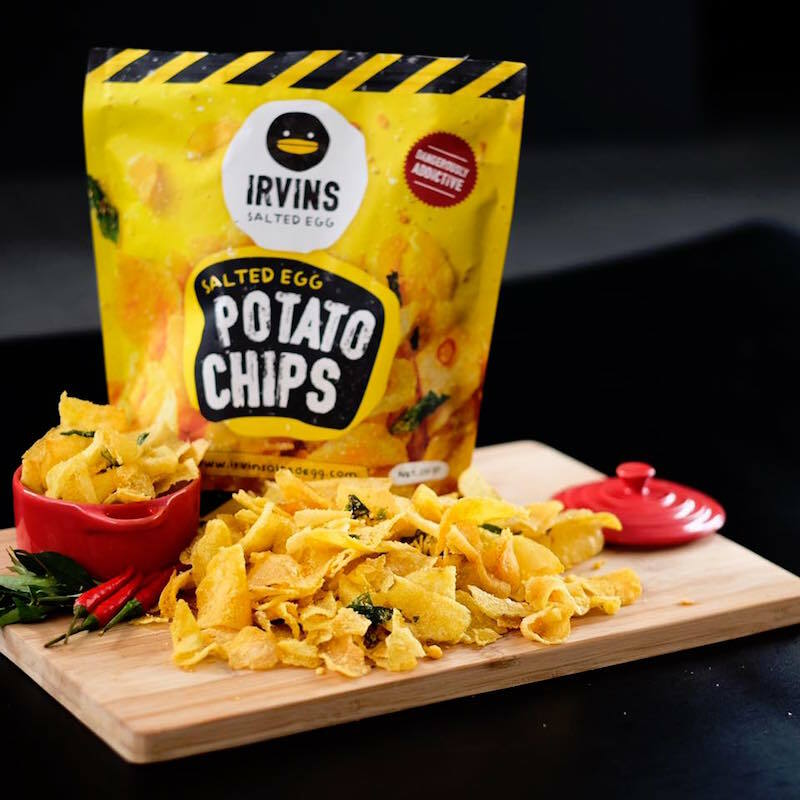 One of the brands to kick-start the salted egg snack craze, Irvins' original nibbles are just as #dangerouslyaddictive as described. You know you're probably gonna pay for it with an unhappy throat or stomach at some point, yet you just can't help but plow full steam ahead until the bag is empty anyway. Here, the salted egg coats everything from potato chips to fish skin to cassava chips, with spicy and non-spicy versions. Really, they're just the kind of snack that you want for an afternoon in front of the TV, or in between furious typing sessions on your laptop (prepare for grimy keyboards though). They're just versatile and moreish like that, and we wouldn't have it any other way. Available at seven outlets, including L1-K3 Orchardgateway. S$7.50-S$16/packet. This one's a no-brainer: As you can tell by its name, the brand is all about the mouth-numbing sensation of mala. 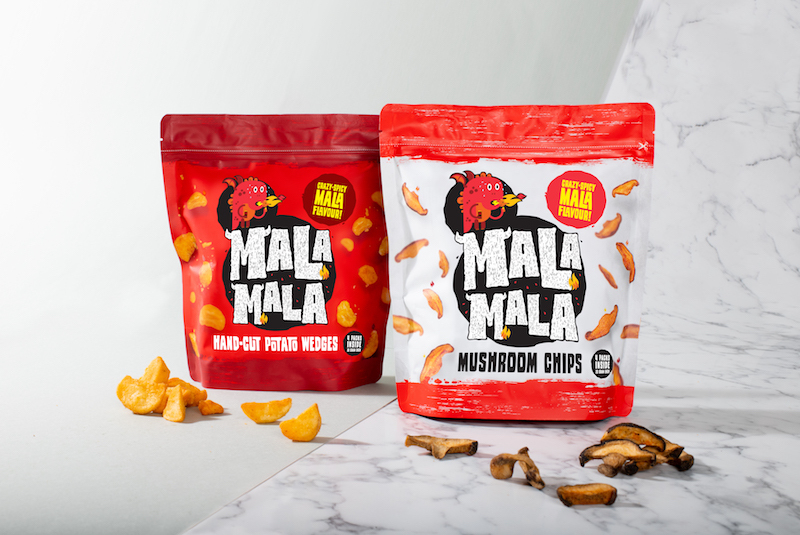 Formulated with a secret blend of spices - after much research and experimental trials - the chunky hand-cut potato wedges and sliced shiitake mushroom chips are tossed with ingredients such as Szechuan chilies, peppercorns, and star anise. But fret not if you're a wimp when it comes to strong flavours - just go for the "mild spicy" option instead of "super spicy" or, er, "crazy spicy". Available online and at #B1-32 Paragon. S$8-S$9/packet. Set up by a mala enthusiast, this company is a spice addict's idea of heaven, featuring two types of chips dusted in a mix of dried Szechuan chilies, peppercorns, ginger, and fennel. Produced in a local factory, the potato and cassava slices are slow-fried before getting doused in heat and poured into plain, brown packaging. But don't be deceived by its simple appearance and gentle zing - once you've dug your way through the packet, the fiery kick creeps up on you unaware. At least it did for us - although we have to admit we're weaklings when it comes to anything remotely spicy. Available online and on platforms like Shopee and Lazada. S$30/a pack of five. Another place to get your salted egg fish skin and laksa potato chips craving satisfied, Snacky & Crisps may be a little more low-key compared to the rest on this list, but it spares no expense in cooking its crisps fresh on the wok every day. If you're all about salted egg, the double layer of creamy goodness covers each piece of fish skin, spiced up with curry leaves and bird's eye chili. Then there's the laksa chip, with its familiar aroma of coconut, shrimp, laksa leaf, and spice blend. Available online and at selected Cold Storage, FairPrice Finest, and Cheers stores. S$7-S$7.50/packet. One of the first to specialise in salted egg yolk potato chips and fish skin crisps, The Golden Duck has since expanded to set its sights on another local favourite: chili crab. 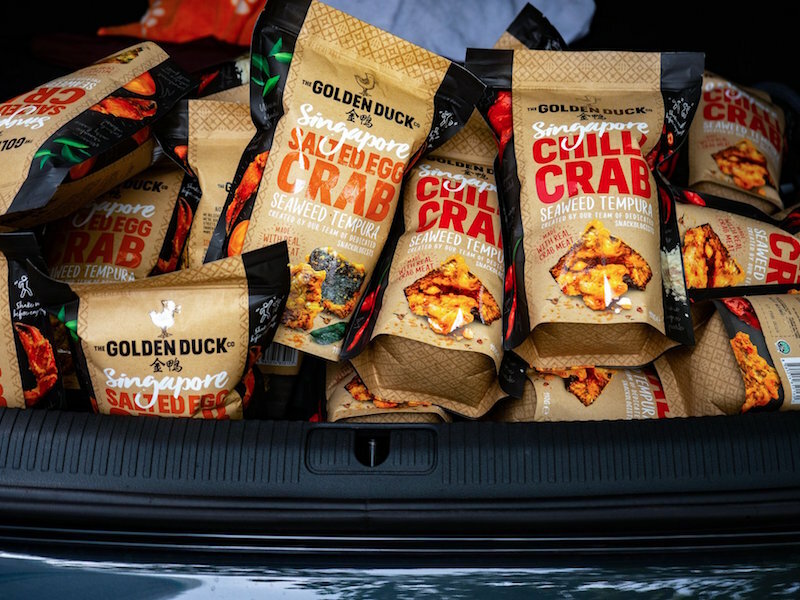 Besides its tempura-coated seaweed with flakes of chili crab essence and bits of actual crab meat, the brand has also recently launched a salted egg crab seaweed tempura snack along with sleek new packaging. Minimal artificial seasoning is employed here; instead, the gourmet treats use real ingredients as much as possible in each recipe. It says "not all snacks are created equal", and we can't help but agree. These are way too addictive to be good for your waistline. Available online and at nine The Golden Duck outlets, including #B3-K3 Ion Orchard. S$7/packet. 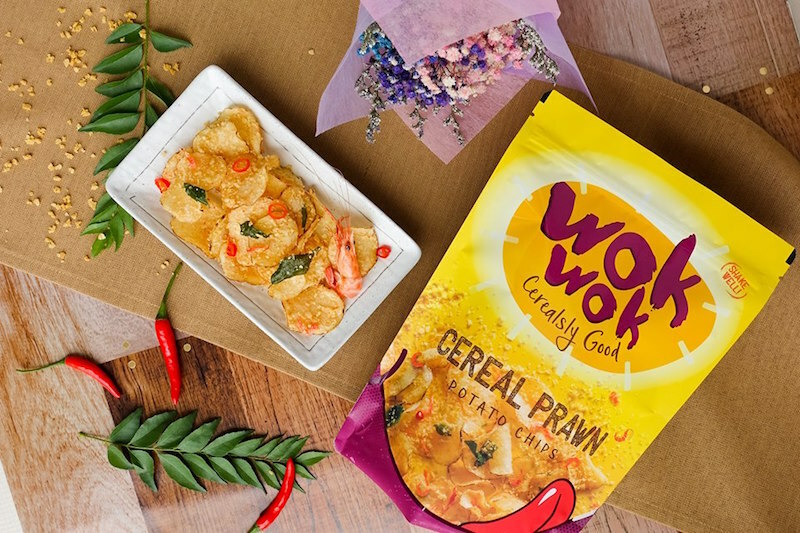 A label with a penchant for puns, Wokwok jokes about its cereal prawn potato chips as a #cerealslygood snack. Newly launched and brought to you by the people behind Ah Tan Wings (known for their har cheong gai chicken), the savory bites are one of those treats that you may not be able to put down once you've started. So if you're already obsessed with the zi char seafood dish, you'll probably want to savour every bite of the chips, which are fried and mixed with cereal flakes and prawns to absorb as much of the flavour as possible. Available to reserve online and at Tanjong Pagar Xchange Booth D. S$7.90/packet.